Translations Rosanna Warren has contributed to. Four poems by Patrizia Cavalli in My Poems Won’t Change the World, Patrizia Cavalli, ed. Gini Alhadeff, Farrar Straus and Giroux, 2013. With grateful acknowledgment to Farrar Straus and Giroux. Three poems by Pierre Reverdy in Stained Glass, W. W. Norton, 1993. Reprinted in Pierre Reverdy, ed. Mary Ann Caws, New York Review of Books Editions, 2013. With grateful acknowledgment to W. W. Norton. Reprinted by permission of the Modern Language Association from An Anthology of Nineteenth-Century Women's Poetry from France, edited by Gretchen Schultz (New York: Modern Language Association, 2008). “To Delia,” “The Stranger,” “A Woman’s Pen,” “The White Page,” “Eastern Day,” “The Young Girl and the Ring Dove,” “Fresh Water,” by Marceline Desbordes-Valmore. Reprinted by permission of the Modern Language Association from An Anthology of Nineteenth-Century Women’s Poetry from France, ed. Gretchen Schultz, Modern Language Association, 2008. Four odes of Horace, Horace: The Odes, ed. J. D. McClatchy, Princeton University Press, 2002. With grateful acknowledgment to Princeton University Press. 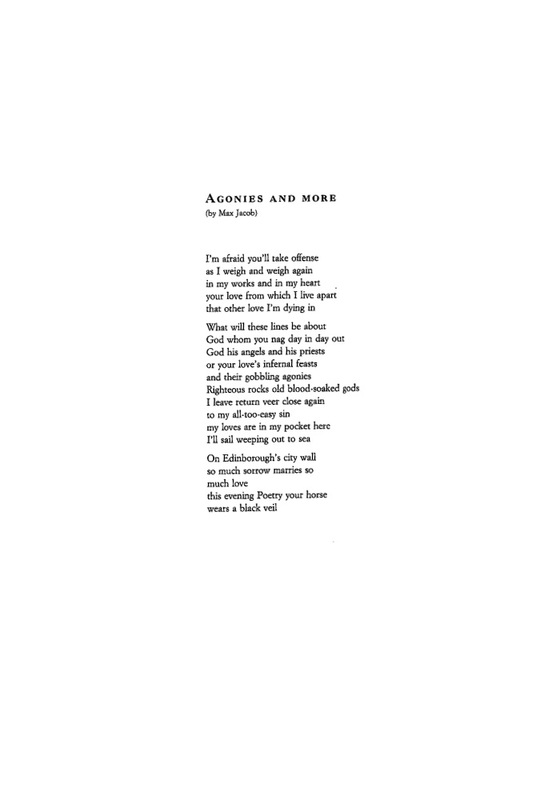 “Le Repos dans la suite des jours,” selections from Michaël Glück, American Poetry Review, Vol. 39, No. 4, July/ August 2010. With grateful acknowledgment to American Poetry Review. “Le Repos dans la suite des jours,” selections from Michaël Glück, Seneca Review, Vol. 40, No. 2, Fall 2010. With grateful acknowledgment to Seneca Review. from Stained Glass, W. W. Norton, 1993. With grateful acknowledgment to W. W. Norton. from Stained Glass, W.W. Norton, 1993. With grateful acknowledgment to W. W. Norton. Two poems by Catullus in Each Leaf Shines Separate, W. W. Norton, 1984. With grateful acknowledgment to W. W. Norton.